I'm coming up with ideas for molds faster than I'm making them or casting. 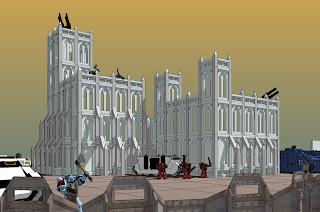 Here's an update showing floor tiles (that you can't see) and a multi-use buttress element...and some entourage for fun and loose scale (thanks to the modelers of 3D Warehouse). While I didn't shoot a pic yet, I did try another sand mold blast crater the other night. It came out better, but I'm still not sure they're worth making. I'll try to get it on here, I'm interested in getting your opinion (may be hard to tell without being painted). Of course, for an average cost of pennies, they look pretty good.